Vancouver, British Columbia--(Newsfile Corp. - December 4, 2018) - Jaxon Mining Inc. (TSXV: JAX) (FSE: OU31) (OTC: JXMNF) (the "Company") is pleased to announce it has received the assay results from diamond drill holes BB18-01 to BB18-03. The Company is still awaiting the assays results from holes BB18-04 and BB18-05 which were drilled at different angles, azimuths and depths from the same platform used by BB18-03. All 5 holes targeted the Backbone gold-cobalt tourmaline breccia mineralization zones along strike at Red Springs. 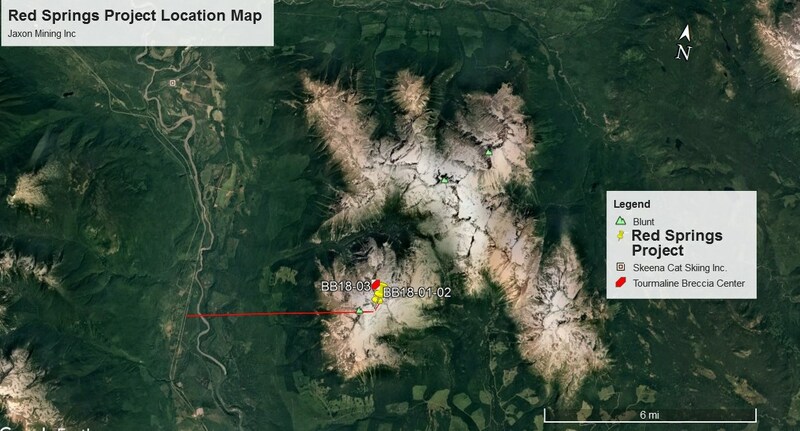 Located on the Company's 44,000 ha Hazelton property in the Skeena Arch area of northwest British Columbia, Red Springs is only 9 km away from BC Highway 16 (Figure 4). The Company has received the IP and magnetic surveys report for Red Springs from Simcoe GeoScience, which identifies a total of 32 IP and magnetic anomalous zones. The report will be released after evaluation by the Company's geology team. Tony Guo, Jaxon's COO, commented: "It is an excellent discovery that we have intercepted a total thickness of up to 26 m gold-cobalt tourmaline breccia mineralization zone at BB18-03 which includes 12 m of 2.03 g/t Au equivalent and 2 one m high grade massive sulphide mineralization sections near both foot wall and hanging wall with gold equivalent of 8.10 g/t and 4.97 g/t Au, respectively. It confirms the shallow dip extension of high-grade gold-cobalt tourmaline breccia mineralization from surface outcrop to the down hole 70-90 m in BB18-03 (Figure 1), which has a reported 3.10 g/t Au equivalent for 13 m mineralization outcrop, as reported in the Company's news release dated September 20, 2018. BB18-01 and BB18-02 have intercepted a narrow mineralization at down hole 10 to 20 m near surface. The major mineralization at BB18-01 and BB18-02 have been weathered out considering the 100-m elevation difference between BB18-01/02 and BB18-03 (Figure 2). The Company plans to drill more holes in 2019, to the north of BB18-03, in close proximity to the Backbone tourmaline breccia centre or to the west of the current BB18-01 to BB18-03 connection line." Given the converging positive results, development of a field work program is underway. 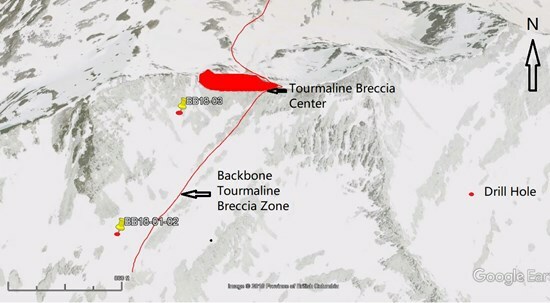 With the market's support, the Company intends to continue to drill the tourmaline breccia zones along the 1000 m strike and its west dip direction and to drill test the porphyry targets in spring and summer of 2019. Located in northwestern BC, the Red Springs Project contains porphyry -related, sedimentary-hosted gold-cobalt tourmaline breccia mineralization with associated copper, bismuth and antimony (Figure 3). It is in a well-developed infrastructural area and only 10 kms away from major highway and 2 kms from a local forest logging road (Figure 4). It is a new discovery for this type of mineralization in BC. 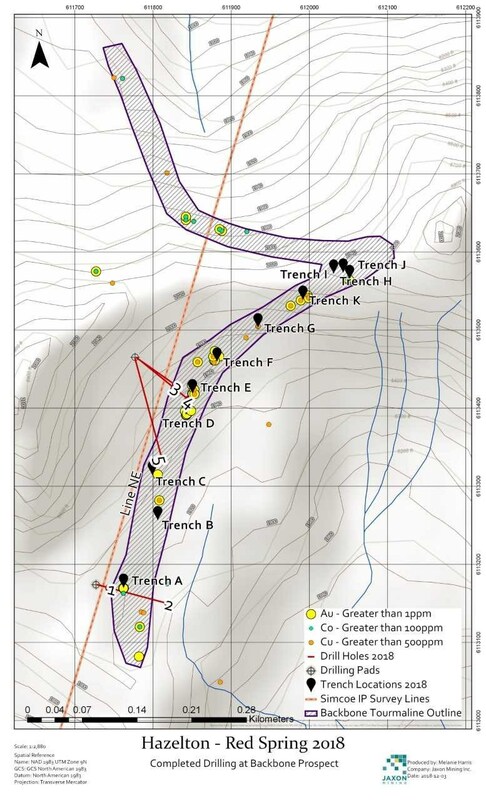 The objective of the Phase One drilling program was to determine the width, continuity and grade of gold-cobalt tourmaline breccia mineralisation at depth. 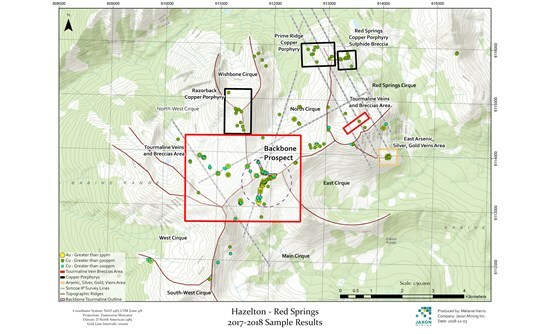 A further objective was to demonstrate the viability of IP geophysics as an exploration tool for the mineralisation at Red Springs and provided the opportunity for further down-hole geophysics to better define the geometry of any mineralisation intersected during the program (Figure 6). 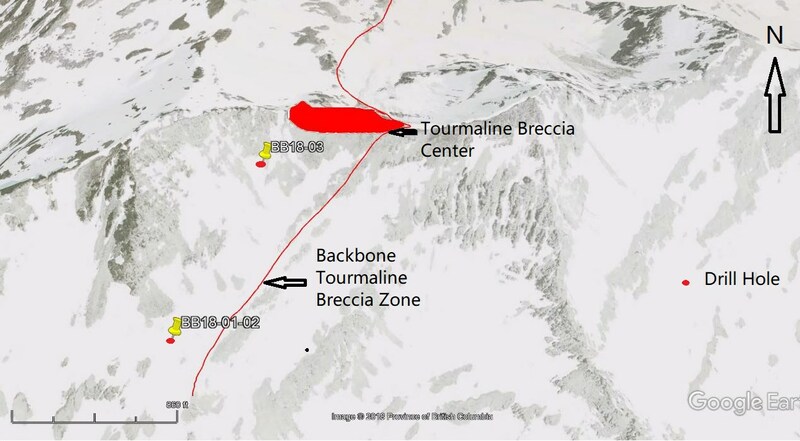 In addition, the results added to the Company's knowledge of the nature of the tourmaline breccia mineralisation and its controls. For Capital Markets for Jaxon Mining Inc., please call 778-938-4459, for Investor Relations, please call 604-609-6152, and for Corporate enquiries, please call 604-398-5394.